The American Sulphur Horse Association was formed in 2003 to protect, promote, preserve and educate about the rare and beautiful Spanish American or Iberian American Sulphur Horse. 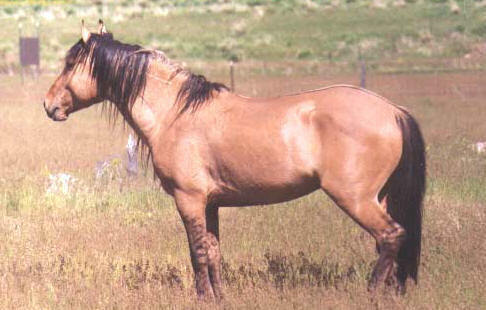 The Association was formed to help preserve the Iberian American Sulphur Horse. These horses lived, high in the Utah Mountains, breeders, preservationists and Sulphur horse fanciers, realized that the Spanish Sulphur Horse Herd are the most pure Ancient Spanish of all the wild horses - undiluted by modern domestic horse genes. No one disputes the rarity and uniqueness of the Sulphur horses or that they have genetically tested to belong within the Colonial Spanish breed group, an incredible discovery after hundreds of years since the Spanish Conquistadors brought them to our shores. This spurred a small group of people passionate about saving the Sulphur horses to take action. They soon saw a huge need to start an Association to preserve, promote and protect these rare and beautiful animals before it was too late. The following pages will have information on the Association and what the American Sulphur Horse Association's goals are in preserving, promoting, protecting and educating people about the Spanish/Iberian American Sulphur Horse. The American Sulphur Horse Association (ASHA) is a non-profit organization that exists to preserve, promote, and perpetuate the Spanish/Iberian American Sulphur horse, in cooperation with the SulphurSprings Horse Registry Inc. and Utah's Cedar City Bureau of Land Management (BLM) to enhance the wild herds of Iberian mustangs which currently inhabit the Mountain Home Sulphur Herd Management Area. Founded in 2003, ASHA was formed to support the Iberian Spanish American Sulphur horse breed. ASHA is a breed Association for owners of Spanish American Sulphur and Half- Spanish American Sulphur horses. ASHA looks forward to welcoming new members and their horses into the ASHA! "About The American Sulphur Horse Association"